With the sun setting behind them, Lonmin mineworkers this week retraced their steps across a field where their co-workers lay dead on August 16. Almost 250 workers from the Lonmin platinum mine, in the North West province’s Marikana town, recalled to their lawyer Dali Mpofu what transpired on the killing field next to the mine. Mpofu is set to represent the workers at the government-appointed Farlam Commission of Inquiry which resumes on Monday (October 22) in Rustenburg, North West province. The commission was postponed after a false start earlier this month. The commission is intent on uncovering the truth behind the police shootings of at least 34 Lonmin mineworkers who were on strike for salary increases. Jim Nichol, a London-based criminal lawyer, is meanwhile working with the Association of Minerals and Construction Union (Amcu) on its defence at the commission. Amcu has been blamed for instigating strikes as a means to gain support from mineworkers who have lost faith in the National Union of Mineworkers (NUM). Nichol said this week that he was intent to prove to the commission that “this shooting was one big crime”. “We know that there is lots of video that has not been seen by the public. We have been served with the indexes of documents held by the other parties. The police and Lonmin have video and we will view that,” said Nichol. Nichol said they intended to prove that this “decision was taken two or three days prior to August 16” by police bosses and even President Jacob Zuma. While the commission unpacks the killings, some of Lonmin’s 28,000 workers will likely still be on strike. They downed tools again this week, after being back at work for a month. This time around they are striking against alleged harassment. One Lonmin mineworker, who did not want to be named, told Weekend Argus this week that “workers felt unsafe”. Speaking inside his tiny shack – which has no electricity, toilet or running water – this worker said that recent arrests were conducted by the “police and people who are pretending to be the police”. “Everything is worse than before. Some of us have been targeted and taken from our homes. We are also mistreated at work by the managers. You can’t walk freely,” said the mineworker. He said that most workers were ready to go back on strike because they had not yet seen salary increases. He said he earned R4,000 a month and wanted a basic R12,500 salary so that he could help his wife, three children and family in the Eastern Cape. He also needed to pay rent and cover his expenses in Marikana. The koppie he referred to is the rocky surface next to Lonmin’s operation in Marikana where workers gathered to resist the company’s unwillingness to increase their salaries. Workers ran from the koppie across an open field as police chased after them on August 16. Lonmin’s strikers along with mineworkers from other mines defied Zuma’s call this week for them to return to work and keep the country’s economy going. They resolved to stay on strike until their salary demands were met. 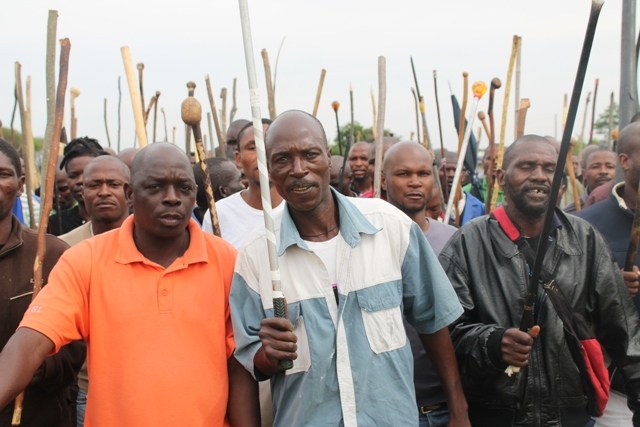 Lonmin is in a region where mineworker strikes have spread rapidly after its initial action. Samancor chrome mine in Mooinooi, located 8km from Marikana, this week saw strikers gathering at two of its four operations in the province. Strikers were peaceful. Police presence was strong. Some Samancor mineworkers were arrested on Tuesday morning during a scuffle with police. Phillip Mntombi, a production team leader at Samancor, said mineworkers there would continue their strike that started late last month. Mntombi talked about Samancor worker’s plans to work with Amcu, whose leadership this week addressed workers in front of the mine as police looked on. “We don’t trust the National Union of Mineworkers anymore. We wanted to negotiate with management ourselves but it is the law that we need to do bargaining with a union. We don’t want to work with a union now but have no choice. We will work with Amcu but we will remain independent,” said Mntombi. Worker committees organising strikes at various mines in North West, Gauteng and Limpopo provinces met last Saturday (October 20) in Marikana to form the National Strike Committee (NSC). They vowed to shut down platinum, gold, coal, iron and diamond mines countrywide until their salary demands were met. The Democratic Socialist Movement (DSM), a national lobby group describing itself as a “revolutionary Marxist organisation”, is supporting workers to organise a national strike on November 3. It wants workers from various industries to join a general strike demanding salary increases across the public sector. Mametlwe Sebei, a DSM leader, said they would plan a march to the government’s headquarter at Union Buildings in Pretoria. “Workers have agreed to escalate the struggle… The ANC and Cosatu in the tripartite alliance are uniting to catch strike committees. The government has made its intentions clear. They want to down the worker’s strike with blood,” said Sebei after the worker’s meeting. Makhalemele Motaung, at the meeting to represent striking mineworkers from Harmony Gold Mine in Gauteng, said their strike started three weeks ago. It had no end in sight. Sole Malejane, a development and construction worker at AngloGold Ashanti mine in Gauteng, said their strike started last month at the “deepest mine in the world”. He said 24,000 mineworkers were on strike at the mine. This strike also has no deadline. “We are demanding R18,500 a month and at the moment many of us earn R4,800. We are meeting every day and all the mines will support this strike,” said Malejane. Strike leaders at Anglo American Platinum too resolved to hold off work until salary increases were attained. This mine is the world’s largest platinum producer and is located in Rustenburg. Mine bosses responded to strike action by dismissing 12,000 workers who did not return to work. Worker’s committee leaders from various mines shared tactics at meetings outside mines and even under a tree in a public park in Rustenburg this week. Their intensified action comes at a time when mineworkers on strike at various sites face arrest and dismissal. Mostly mineworker residents of impoverished townships around the Lonmin mine have blocked roads with rocks to prevent the police from entering their area. Spending time in St George’s Cathedral in the city this week took Kate Ncisana back thirty years to a time when she took refuge in the church against apartheid injustice. It was in March 1982 when Ncisana and 56 others protested with a 23-day fast against their eviction from an informal settlement in the city. Their story is currently being retold with a photographic exhibition, ‘An African Story of the Mother City’, at the cathedral. The images of their eviction were collected from the archives of various photojournalists. These include former Argus newspaper photographer Mike Mackenzie as well as Guy Tillim, David Goldblatt and Paul Alberts. Photo by Mike MacKenzie at the exhibition. The black and white photographs take the viewer into the lives of informal settlement residents and the injustice they faced. Women and their children particularly are exposed to police aggression in the images. One woman bathes her baby in a tub, surrounded by rubble, and behind her a bulldozer gathers zinc sheets that were previously homes. Another woman is seen carrying a metal sheet on her head and a baby on her back. Various images speak of an intention to crush the human spirit. It is impossible to walk away from this exhibition unaffected, angered and bewildered by the nonsensical implementation of apartheid. Ncisana has lived in Khayelitsha since police moved her there in 1982. She recalls the day when her shack was dismantled and she was thrown off the land where she had built her home. “You leave your house standing in the morning when you go to work. You hear on the radio that your house is being broken down by police. It took me two hours to get from work to home and when I got there I found only the leg of my kitchen table,” says Ncisana. Ncisana and others who were evicted made their way to the cathedral to pray for help. “We decided to go to the cathedral to pray and fast. When you pray for something you have to fast so that you have strength in your prayers,” says Ncisana. The photo exhibition notes inform that the “group fasted for 23 days until (former National Party cabinet minister) Piet Koornhof agreed to negotiate on the faster’s terms”. “The fasters represented a broader group of squatter residents who sought recognition as citizens of Cape Town. They sought the right to live and work in the city. Some of these citizens, like Kate, had in fact been born in Cape Town but was forced by Acts, such as the Breadwinner’s Clause, to live alone in the City without her family,” it continues. Exhibition notes inform that the apartheid government’s Breadwinner’s Clause “allowed women, who were the heads of households, temporary permits to work in the city provided they took their children to live under the care of others in the rural areas or homelands”. 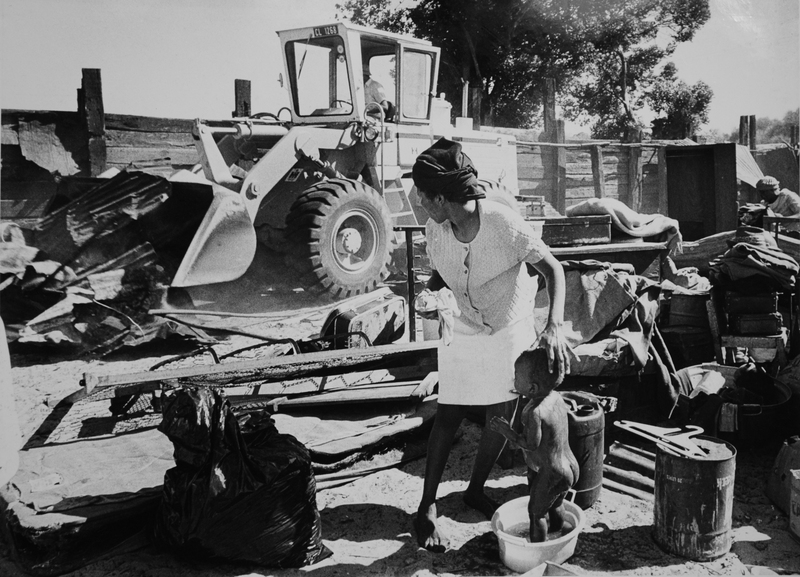 The former government also implemented laws that prevented black women from “obtaining permanent rights to live or work in the Western Cape and from legally bringing their families to live with them in the city”. Migrant workers were also not allowed to live in Cape Town permanently. Ncisana and others fasted for the right to stay in Cape Town. After being forcibly removed and then fasting, Ncisana and others were granted the right to stay in the Western Cape. “After all that fighting, we were then given permits to stay in Cape Town. We got our rights. Then the police took us to Khayelitsha where we got a place to put our shacks,” says Ncisana. Ncisana walks visitors through the exhibition and shares her story with them. “Lovey, I’m trying to introduce my struggle to the people. They don’t know our struggle,” says Ncisana. Remembering resilience of past protests against apartheid injustice to inform present social struggles is at the heart of this exhibition. “Lovey, I wish people can learn from our struggle. We were not violent when we struggled. We did it peacefully,” says Ncisana. Lynette Maart, project coordinator of the Crypt Memory and Witness Centre at the cathedral, says this exhibition speaks about the “need to celebrate ordinary people”. “It gives other people courage in the present to do simple acts that will make change. Leaders can’t change society by themselves. We want to stimulate citizens to become change agents,” says Maart. Maart is a co-curator of the exhibition says “it’s important that we look at these struggles for social cohesion”. “The squatters sought sanctuary in the cathedral. Their fast was innovative. They put their bodies on the line. That’s all they had and they acted to defeat the system,” says Maart. Sandra Prosalendis, co-curator of the exhibition, says “we need to hold up to the light stories that could have an influence on the decisions we make today”. “When one walks through the exhibition one is struck with a sense of disbelief at the sheer wickedness of apartheid, we have forgotten how truly inhumane that past was and no matter the comparison with today’s housing, urbanisation and land issues we can never ,ever, say that people had it better back then,” says Prosalendis. The exhibition also takes the shape of a book, ‘Behind and Beyond the Eiselen Line’ written by Josette Cole, which reflects the stories of 40 of the fasting protesters. This book was commissioned by the Crypt Memory and Witness Centre. A few decades ago Joanne ‘Shirley’ Ellat was sent to Nazareth House in Vredehoek after her mother abandoned her. Now her daughter Nazreen Ellat volunteers at the institution to raise funds during tough economic times. Ellat was born in Cape Town in 1958 to a single mother who left her in a hospital bed as having a child out of wedlock was then regarded as scandalous by local society. She presently lives in Perth, Australia, where she works as a community corrections officer. Her daughter is a business studies and public relations graduate. Ellat walked with Nazreen through the Nazareth House premises where she lived until she was almost 14 years old when she left South Africa. The two returned to Nazareth House three years ago and again this month for the institution’s 130th anniversary. “We had so many different characters at this home,” said Ellat as she reminisced through the hallways and church. Ellat said this proved that abandoned or orphaned children were not ‘broken’ adults as many might believe. “When I was at university a lecturer talked about what makes a family and a non-family. She put orphans under non-family. I stood up and disagreed with her,” said Ellat. Ellat said she told her three daughters in “over-exaggerated circumstances” all about growing up at Nazareth House. Nazreen said when she first entered the house she thought everything would be much bigger than reality. “My mom told me a lot of stories about how she grew up. I thought she had an enormous family. And that she and her brothers and sisters at Nazareth House seemed interesting and they got up to a lot of mischief,” said Nazreen. Nazreen will volunteer for the next five months with the Nazareth House fundraising unit. She had already volunteered at the institution for three months in 2010. “I thought that I could do a lot of good work here. Help is needed and everyone works very hard,” said Nazreen. Sister Margaret, a social worker at Nazareth House, said they needed almost R1-million each month to run various projects, including housing and caring for children who are disabled and HIV-positive. They also take care of elderly persons. “It’s all going downhill as far as the funding goes. We have cut down on projects. Last year we had to close a unit that took care of HIV positive adults. We found that there were children with HIV whose parents also needed help. But we can’t help them anymore because we received no funding for that,” said Sister Margaret. To raise funds, Nazareth House will hold a Fun Fair on its premises in Vredehoek on October 26 and 27. 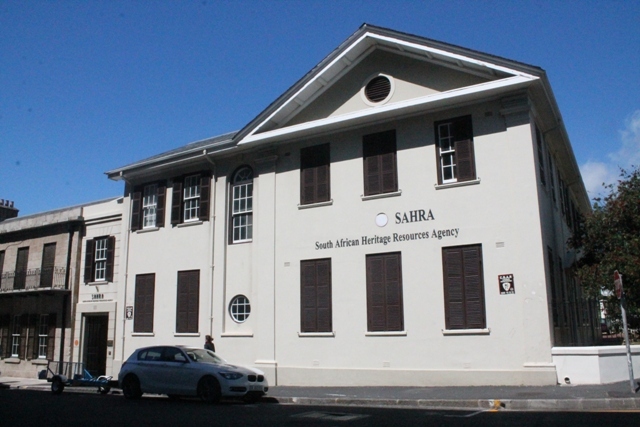 Missing assets worth R10 million and plans to investigate its chief executive for misconduct have left the SA Heritage Resources Agency (Sahra) crumbling. The organisation is also operating without a fulltime chief financial officer and corporate affairs executive and the chief executive, Sibongile van Damme, has been on sick leave for the past six weeks. Sahra is constitutionally mandated to protect the country’s national heritage sites. It employs 62 people and its annual budget is R36m. Its messy state of affairs became evident this week when the Cape Times obtained a copy of its annual report and the auditor-general’s report that slams its incompetence for the last financial year ending in March 2012. Auditor-general Terence Nombembe gave the agency’s books a disclaimer for the last financial year. It found “no explanation for journal entries totalling R10 267 000” for fixed assets that cannot be traced. It also found previously that “appropriate audit evidence could not be provided to support fruitless and wasteful expenditure amounting to R344 889”. “The entity (Sahra) proceeded with retrenchments despite receiving an instruction from (Arts and Culture Department) portfolio committee that retrenchments should be avoided. “This included the payment of R1 014 729 in retrenchment and severance pay benefits,” stated Nombembe’s report. Sahra also owes the SA Revenue Service “amounts relating to outstanding employees tax and penalty plus interest”. Advocate Dave Mitchell, independent chairman of Sahra’s audit committee, told the Cape Times yesterday that the missing assets would probably include “specialist equipment, televisions, vehicles and others”. “Adjustments have been made to hide assets that have gone missing. The guy responsible for fixed assets (at Sahra) has been sick and off work since May. “The first principle of accountability is that the responsible official must be there. They’re playing the ill- health story,” said Mitchell. He said that the audit committee was set on conducting a forensic inquiry but could not yet confirm when it would begin. Mitchell said his audit report, conducted after the auditor-general’s report, confirmed that Sahra “did not maintain an effective system of internal control”. “This applies particularly in the areas of human resources management, fixed assets, procurement and supply chain management, and controls over the preventing and reporting of unauthorised, irregular and fruitless and wasteful expenditure,” the internal audit report found. When the Cape Times visited Sahra’s head office on the corners of Roeland and Harrington streets, acting chief executive officer Dumisani Sibayi confirmed that Van Damme was into her sixth week of sick leave. Sibayi is Sahra’s heritage resource manager. Sibayi acknowledged that they were in “trouble” but showed the Cape Times that they were still operational. Somadoda Fikeni, chairman of Sahra’s council of board members, in a turn-around plan submitted to Parliament last month, said it would launch a forensic inquiry to “investigate the chief executive (Van Damme) for misconduct”. He said there was a “range of systematic weaknesses” at Sahra. This included “poor personnel quality” and an “institutional culture of poor performance, lack of accountability and anarchy”. A businessman who wanted to sell liquor in Bo-Kaap has abandoned plans to open a restaurant there while residents vowed yesterday to keep the suburb alcohol free. Samuel Wekwete confirmed in court papers that he would not open a restaurant at 59 Wale Street. He had applied for a liquor licence transfer from Dutch-owned company Beekay 122 Investments who also own the Wale Street premises. The Bo-Kaap Civic Assocation’s legal action was launched at the Western Cape High Court yesterday. None of the 11 respondents were present at court. The matter was postponed to December 7. The association wants the court to set aside the liquor licence granted to Beekay. It also wants the court to prevent the liquor licence transfer from Beekay to Wekwete. Among those called to court was Wekwete and Beekay owners. Wekwete has not filed responding court arguments but in a document dated October 5 he confirmed he would walk away from plans to open Abantu Restaurant in Bo-Kaap. This document is a print-out of an e-mail filed in the association’s court application. It was sent to Seehaam Samaai, director of the UWC Legal Aid Clinic, last Friday. “Please note that after serious consideration of the facts and events surrounding the Bo-Kaap community and the liquor licence issue over the past two months my business and I personally have decided not to trade at 59 Wale Street as of close of business today,” said Wekwete. Beekay owners said via its local legal team, Marcusse Law Firm, that it would consider opposing court action aimed at having its liquor licence revoked. It also asked Samaai to “forward a copy of the court order to our offices”. 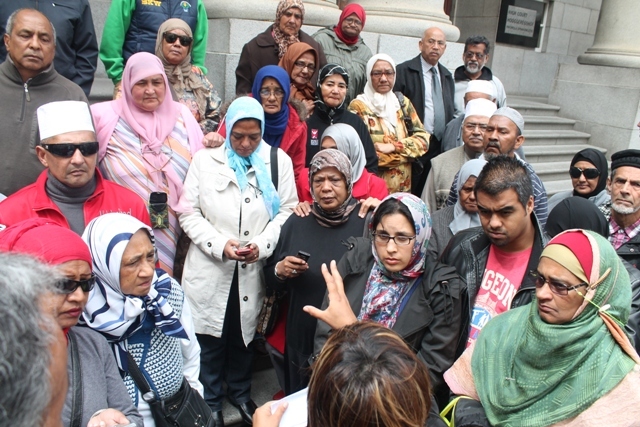 Osman Shaboodien, chairperson of the civic association, and other Bo-Kaap residents went to the Caledon Square police station in Buitenkant Street in the city yesterday to request police to investigate how the liquor licence was granted to Beekay. Shaboodien said they did not want any persons selling alcohol in Bo-Kaap. “We cannot compromise on a liquor licence. Our demand is very simple: scrap the licence. We want to keep Bo-Kaap dry. We will take action against anyone who wants to sell alcohol in Bo-Kaap,” he said. Gabebah Jassiem, chairperson of the Bo-Kaap Cultural and Heritage Association in Bo-Kaap, said it was “disrespectful” that companies want to sell alcohol in an area which has a largely Muslim population. Islam prohibits alcohol consumption. “We have the athaan (call to prayer) going off and we have prayers at night and when people get drunk they have loud parties. They get rowdy and it is a disturbance for people who are praying at mosque,” said Jassiem. A missing sculpture mystery in Stellenbosch has been solved after parents of a vandal found the stolen artwork in their toilet. Cape Town actress and artist Sue Pam Grant’s sculpture ‘Swimmer No. 5’ was sliced above the ankles and stolen off its base during the night of September 12. It stood behind a fence at the Stellenbosch Botanical Gardens. Andi Norton, project manager of the 20 Stellenbosch sculpture exhibition, told the Cape Times yesterday that a “young man from Parow” vandalised the sculpture. “It’s someone who was visiting friends or a girlfriend at the weekend. Two weeks ago his family’s lawyer phoned me to say that his parents found it in their bathroom. They then returned the sculpture to the gallery that represents the artist in Stellenbosch,” said Norton. She said the family agreed to pay the R60,000 fee for the artwork while ‘Swimmer No. 5’ would be destroyed. “We will not lay criminal charges (against the vandal). We feel very appreciative to the parents that they gave us the information. We are grateful to them because a lot of parents would not do that,” said Norton. 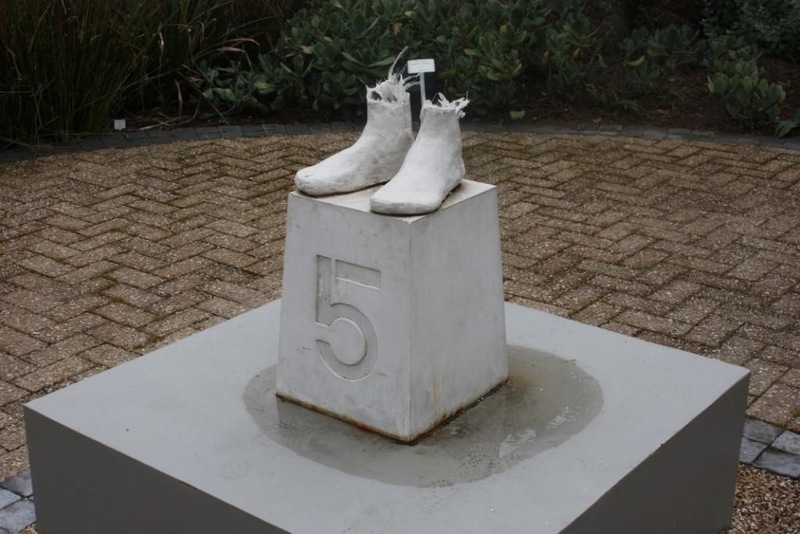 The sculpture’s remaining feet and base have been removed from the Stellenbosch Botanical Gardens where it had been on display since October last year. Grant would not speak to the Cape Times but her Facebook profile revealed she hoped this vandalism was not “just a drunken idiot’s juvenile attempt at trying to display his or her testosterone surges”. “Whoever stole it had to climb over a huge fence as the botanical gardens gets locked at night. Astonishing… There is a ghostly presence in it’s absence… a strong comment as it stands in its mutilated form,” she said. Vernon Bowers, spokesperson for the Stellenbosch municipality, said “it’s a relief” that the sculpture had been found. He said the municipality generally offered a R5,000 reward for the reporting, arrest and conviction of any vandal. “I cannot confirm now if the municipality will take legal action against this vandal,” he said yesterday. Alderman Conrad Sidego, the Stellenbosch mayor, said vandalism was “shameful behaviour”. This article was published in the Cape Times daily regional newspaper in the Western Cape, South Africa, on October 8 2012. 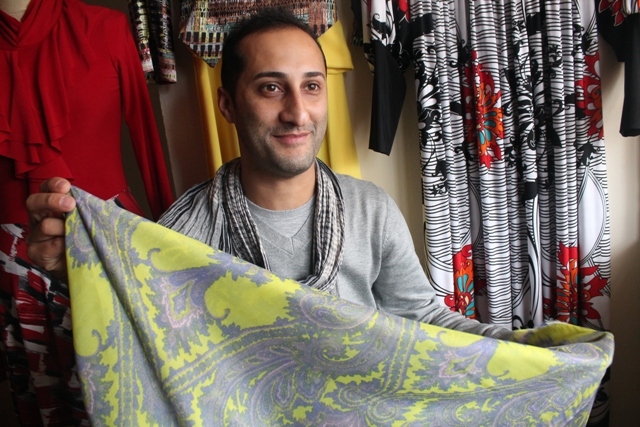 Glossy fashion magazines and a Muslim prayer mat find their place in the consultation room of local designer Mohammad Rawoot who is on a mission to bring modesty back into style. Rawoot showed his latest ready-to-wear range aimed at women who want don’t want to show skin while looking trendy. It’s a shift from his clothing range stocked at Young Designer’s Emporium for the last three years. Rawoot says he has been encouraged mostly by a growth in Muslim women who seek fashion that fits with their Islamic beliefs. This means clothes that do not show off their bodies or hair. Rawoot’s ‘Aura’ collection featured bold geometric prints, headscarves and stilettos. The target market is younger Muslim women who “don’t want to look like their mothers”. “They want to wear headscarves but they don’t want to look old. They don’t want to wear salaah tops (garments worn to pray in). That has stopped some young Muslim women from wearing headscarves because it’s not fashionable. 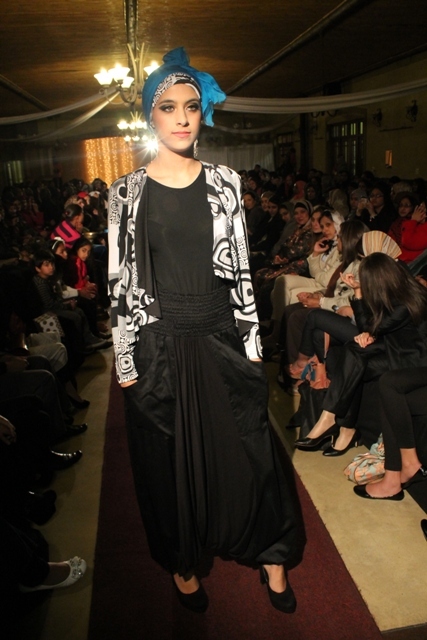 This collection shows that you can wear a headscarf and still look fashionable,” said Rawoot. The young designer from Rondebosch East started his label M Couture in 2000 and says that since then he has had a mix of clients. His Muslim clients have come to him with photos from fashion magazines and asked him to dress them “like that but with sleeves”. “I have to adapt that look to make it more modest. I add a sleeve or raise the neckline. They want the look and colour but the dress needs to be adapted. It used to be very challenging because you can’t just put a sleeve onto a dress. You have to really think about it. It’s like redesigning a house,” says Rawoot. Modest fashion is nothing new though. Muslim women worldwide, who want to follow Islamic principles, cover their bodies with fashionable clothes. “There’s an Arab and North African inspired look all over. You see more headscarves and turbans on the streets. I’m seeing much younger girls wearing headscarves. Before, you only saw the older crowd wearing headscarves. I’m seeing non-Muslims as well wearing turbans. It’s about mixing up cultures,” says Rawoot. Cape Town-based fashion designer Jacques Lagrange says that his clients from Arab lands as far away as Dubai and Amman want couture designs while maintaining their modesty. “They want to go modern but they do cover up because of religion. They want to wear an abayah (free-flowing dress that covers the body) but they want to wear one that is couture. The sleeves are always long and the dresses are always long. They also want to wear matching headscarves and play with modern fabrics,” says Lagrange. Lagrange says that globally fashion designers who create couture also tend to present collections that are “chic and sophisticated”. “Everybody wants to wear (international designer) Eli Saab and when they do they’re always covered up. It’s about an elegant lifestyle,” he says. Globally, the oil-rich Arab world is also creating a buzz in the fashion industry. This not only introduces western fashions to the Arab world but opens new markets for clientele that desire fashion with a different sensibility. Earlier this year, the Qatar royal family reportedly snatched up major fashion house Valentino for US$858-million. Rawoot says the local market needs to catch up. He says his fashion show was intended to show also that dressing modestly and wearing a headscarf. “When people hear modest or ‘hijab collection’ (in reference to the word hijab meaning headscarf) they think old. There is a stigma attached to it because of the way people have interpreted it. It’s now up to people like us to change the way people think,” he says.